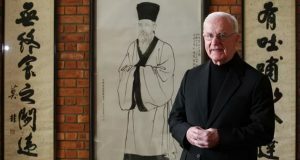 Irish Jesuit Fr Vincent Murphy passed away peacefully on the morning of Monday 28 November at Cherryfield Lodge, Milltown Park. 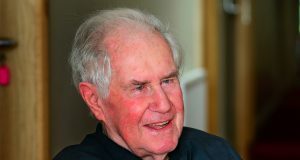 A native of Ranelagh, Dublin, Fr Vincent qualified as a Quantity Surveyor and played for Shamrock Rovers FC prior to joining the Jesuits in September 1954. He was ordained ten years later, in 1964. 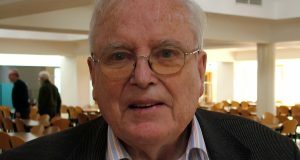 Vincent spent a number of years on mission work in Zambia, then returned to Dublin, where he was in charge of the Mission Office in Gardiner Street and was Chaplain in St. Vincent’s Hospital. In 1996, Vincent moved to Clongowes Community, and he remained there until 2014, when a stroke required that he move to Cherryfield. His last few weeks were spent very peacefully, and he told his Rector that Cherryfield was a great preparation for heaven because of the care he was receiving there from the Staff who came to love him dearly. Below is the homily given by Fr Michael Shiel SJ at the funeral Mass. As we gather to celebrate the long and full life of Vincent – rich in years and bearing much fruit – the above words are very appropriate to sum up the depth of faith of this follower of Ignatius Loyola and his ‘Friends in the Lord’. For if ever anyone was prepared to meet His Lord it was Vincent. Some time last year, when I visited him in Cherryfield, he told me that his consultant had promised that he would live to see the new RWC Champions crowned. After the final, I asked him what his next deadline was. He said: “Now, I’m just waiting for Godot!” To which all I could say was: “Well, I hope you’ll have more luck than the other pair – Vladimir and Estragon! Today we, as Christians, believe that he has. For we believe in the promise of Jesus just heard in the Gospel: “I am going to prepare a place for you, and I shall return to take you with me”. Vincent was born in the year of the Great Depression. He went to school in Synge Street – and how proud he was of his Christian Brothers’ education there! He joined the Jesuits in 1954 as a late vocation, having qualified as a quantity surveyor in Bolton Street, DIT. Outside his professional life, he made his mark in (as he put it) the glory-days of Shamrock Rovers! His contemporaries in the Society used to recount how frustrated Vincent could become as they tried to find an approach to the beautiful game other than a Jack Charlton-like Garryowen-type hoof and follow! The Irish Province’s mission to Zambia was still developing, and Vincent joined the growing band of Irish Jesuits for his regency there in 1959. After theology and ordination here in Milltown, and a final year of study in Rathfarnham, Vincent returned to Africa where he ministered in parish work before coming back again to Ireland to head up the Mission Office in Gardiner Street. His generous care of returning missionaries knew no limits and was greatly appreciated. He also helped out in the Church, and he was Vocations Director as well. He was not destined to return to Zambia, although he retained strong affectionate links with Africa. 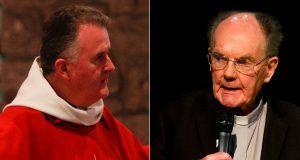 The rest of his apostolic life was spent in Dublin and Limerick, before he joined our Community in Clongowes just 20 years ago. 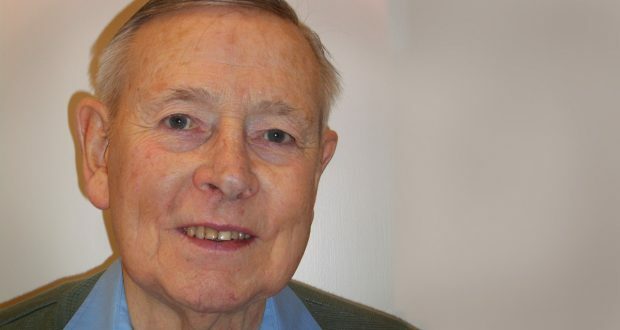 He followed in the footsteps of Fr John Sullivan as he served in the People’s Church and then ministered as Chaplain in St Vincent’s Hospital in Dublin. And lastly, as failing health brought him to Cherryfield Lodge, his final – and very important – mission was to pray for the Church and the Society of Jesus, for his Companions who continue to carry on God’s work in many different fields. Such, in very few lines, is the life of Fr Vincent Murphy SJ. 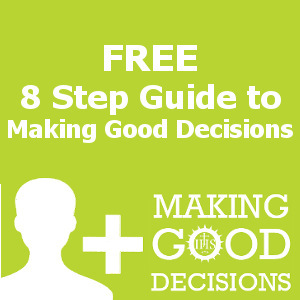 He was unsung and unheralded in the world at large, but so too was he rewarding and fruitful in doing good and in enriching the lives of very many people and families to whom he brought the Good News of God’s saving power, as he lived it in his own life. God’s love was indeed inscribed with iron chisel (his faith) and engraving tool (his generosity) cut into the rock of people’s lives as they experienced his ministering zeal. Nowhere was this seen to greater effect than in his years as Hospital chaplain, where his patience and care for both the sick and the hospital staff bore much fruit and brought comfort and hope to those who were facing an uncertain future. In later years, first of all in Clongowes Wood College and more recently in Cherryfield, God continued to give Vincent as a special gift to others, this time as someone in need of their love and care. It is only right, at a time like this, to pay tribute to the CWC Infirmary Nurses and Community Staff whose care allowed him bonus-years there. For someone who, as I said at the start, was surely prepared to meet his Lord, Vincent seemed simply not to want to let go of his Cherryfield carer-friends, as I was to witness during the past week. It began for me as a simple overnight stay, and it ended as an extraordinary and privileged experience of seeing at first hand – behind-the-scenes, early mornings and late nights – the care of every single one of the staff, both nursing and support. It was fitting that the former dispenser of God’s caring love as a hospital chaplain should himself be the receiver of a quite extraordinary outpouring of care and love by the team in Cherryfield. On behalf of the CWC Community, and of the Irish Jesuits, I can only say a deep-down thanks to each and every one of you. It is our Christian faith which brings us to the Eucharist this morning – our Faith that Christ did indeed return to call His disciple home, when just two days ago, accompanied by George Fallon and myself, Vincent came to the end of his long and faith-filled journey. It was his dies natalis, his heavenly birthday, as the Roman martyrology called it, as his tent that we live in on earth was folded up, and he moved to the everlasting home, not made by human hands, in the heavens. Now, in his turn, Vincent has gone ahead of us to help prepare a place for us and he will be on hand to welcome each one of us to Our Father’s home. So often in life we say good-bye. It comes from the ancient wish or prayer ‘May God be with you’. And today we say it to Vincent at this, his last Mass. Be assured that we will pray for you, Vincent. May you also pray for us. And so we say farewell, and, until we meet again, good-bye.